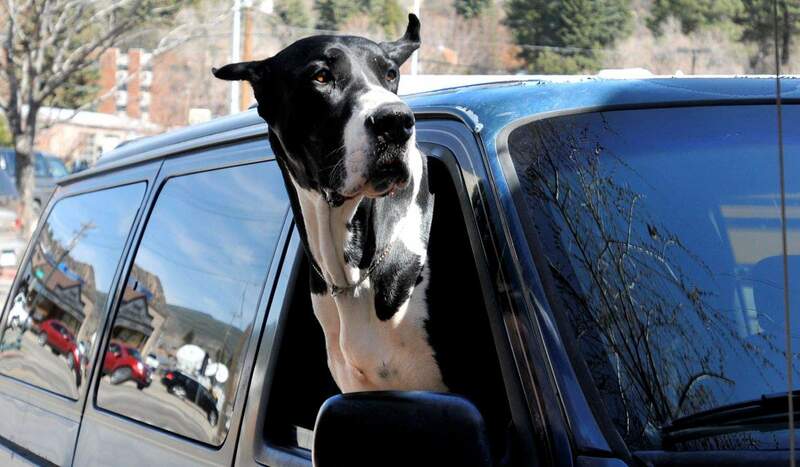 Beth Berras Great Dane watches her work from inside the car. 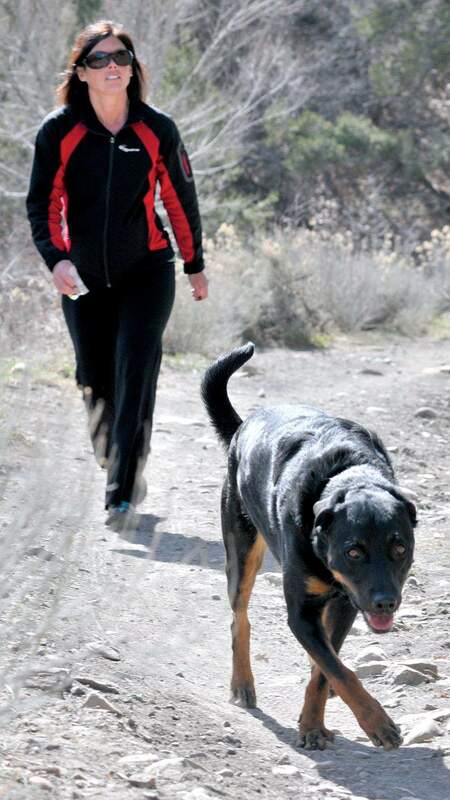 Sawyer, a 4-year-old Rottweiler/Labrador retriever mix, gets some exercise recently with his owner, Tammy Jivery, at Horse Gulch. 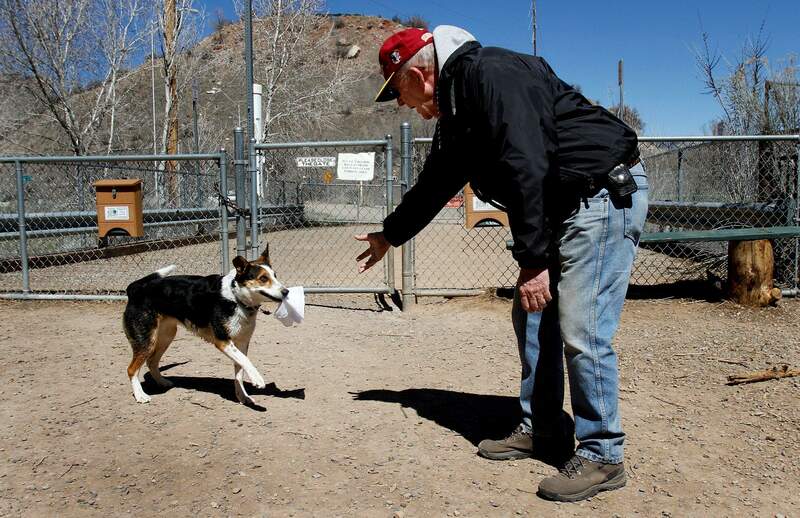 Lou Kiene of Durango plays with his dog Yola at the Durango Dog Park along the shores of the Animas River. Durangos dogs are as eager as their humans to get out and soak up spring, but with both species spilling onto area trails and open spaces, conflicts can ensue. The Durango Herald talked to doggie experts to bring you this primer about how to ensure you and your pup are model residents of our fair town. The bottom line, the experts say, is exercise mutual respect and common courtesy, and harmonious relations among all species will be all but guaranteed. Chris Nelson is director of animal services at the La Plata County Humane Society and, perhaps as a casualty of the job, has four dogs. He said owners need to maintain control of their animals and make sure that they dont jump on or otherwise harass other people. Similarly, people should give animals they dont know some space. This means always ask to approach and pet a dog, even if it appears friendly. Unwanted affection from a stranger could provoke a nip and land the mystified pup in the pound. The city of Durango requires that dogs remain on their leashes within city limits, but they can run unrestrained in the Durango dog park and on all other public lands unless otherwise posted  as long as they are within sight and under voice control. Were lucky we live in a place with so much public land, as far as BLM land and national forest, Nelson said. Durango resident Gini Philipp takes Dorothy to the dog park about three times a week, and as a courtesy to others, she made sure her affable mutt was socially prepared before setting paw behind the parks gates. I didnt start taking Dorothy to the dog park until I knew that she would listen to me and come back to me when I called her, Philipp said. After bringing Dorothy home from the Humane Society as a young pup, Philipp socialized Dorothy around other dogs for a few months before allowing her off the leash in the dog park, she said. Aggressive dogs are forbidden in the dog park, and owners take full responsibility for the behavior of their dogs. The city can stick owners with a dog at large charge when canines are caught without their leash  a $45 citation upon first offense. Dogs also are at large when theyre tethered along public streets, Nelson said. Some owners tie their dogs with enough slack in the leash to block the sidewalk, forcing pedestrians to walk in the street, he said. Unless owners know for sure that they can take their dog into a store, they should leave their canine at home, especially if they plan to drive, he said. Temperatures inside a vehicle can easily get over 120 degrees on a summer day, even with the windows cracked, he said. If dog owners absolutely must bring their canines along, Nelson suggests that owners crack more than one window to cross-ventilate the vehicle, leave the dog plenty of water and be gone only for short bits of time. Forsaken feces is a huge community nuisance that dog owners easily can avoid by making a habit of carrying plastic bags when they take their dog for a stroll, Nelson said. Give all dog owners a good name and clean up after your dog, Nelson said. The city charges a $35 fine for the first failure to remove dog waste violation, which can take place on any public or private property other than the owners. There is no county ordinance against barking dogs, but the city of Durango will charge residents $55 for the first nuisance barking violation. Community members can report nuisance barking to either the police department or animal control. In the great outdoors, owners are most likely to want to let their pets run free. Theres a million places you could go in La Plata County or the surrounding counties, and you could take your dog and never see another soul, Nelson said. But even in such wide-open spaces, problems can arise. Joe Lewandowski, spokesman for the Colorado Division of Wildlife, said dogs instinctively chase other critters, which can have negative effects for both wildlife and dogs. Last year, a dog harassing an elk on the Animas River was killed by a wildlife officer. Owners can be fined upward of $250 when their dogs disturb wildlife, and if an officer is called to the scene, it is up to the officers discretion whether or not to shoot the dog, Lewandowski said. Dogs stress animals and provide unnecessary strain to animals that already face a series of stressors, especially during the winter when they are fighting harsh conditions to survive. In the spring, many mammals give birth to their young, which are especially vulnerable to dogs that can nip at or even kill immature wildlife, Lewandowski said. Coyotes also are effective at coaxing dogs into a fight, he said. If a dog picks up the scent of a mountain lion or bear, dogs could locate and antagonize the predators, then lead them back to the dog owner, placing everyone in danger, he said. Mark Smith, board member of Trails 2000, said proper dog etiquette while out on a hiking trail is making sure the dog is not a problem for other people using the trail. There are people who like to go into the woods that arent very comfortable with dogs, Smith said. Smith, who owns three dogs, said he is concerned that some residents do make their dogs a problem for other people. If that continues to happen, were going to hear more and more loud voices in the community trying to get rid of the whole dog-friendly thing in Durango, and that would be unfortunate, he said.